Turkey's so-called left-wing opposition Republican People's Party (CHP) is a far cry from what a social-democrat party should be and how it functions in Western democracies.The oldest party established by Mustafa Kemal Atatürk, founder of modern Turkey, became the champion of left-wing causes in the early 1970s but in time has gradually transformed into a party that has a left-wing appearance but in fact is conservative and at times even far right. That is why it has never had any mass appeal and has never been a contender for power in the past parliamentary elections. 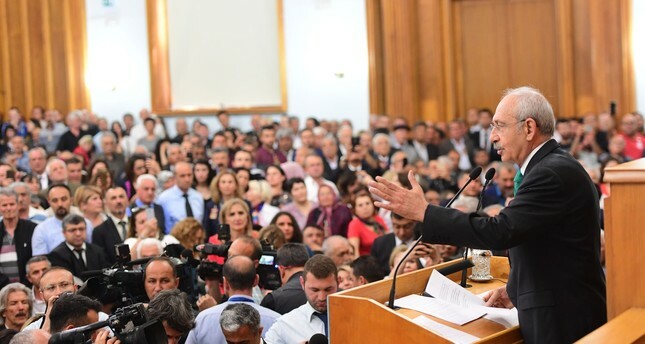 All that the CHP has done in the past is to resign to the fact that the party will never come to power and thus try to maintain its title as the "main opposition" while holding on to its seats in Parliament with its die-hard conservative backers. In the late 1970's the CHP came very close to coming to power in the 1977 elections but fell 11 short of a majority. So the party "bought" 11 deputies from the then-ruling Justice Party (AP) and gave them all cabinet seats and created the greatest example of deceit and cheating in Turkish political history. The CHP was again an actor in the coup of 1997 that toppled Prime Minister Necmettin Erbakan. It engineered the defection of dozens of deputies from the True Path Party (DYP) to create a new coalition that would run the country according to the whims of the junta leaders. The CHP executives have seen they will never be able to come to power in the elections simply because the people do not vote for them so they opted to deceit and cheating. They spread lies and create sedition and thus try to create turmoil that will help it to come to power through undemocratic means. If the CHP had spent its time and energy working on projects and proposals to surpass the services of Recep Tayyip Erdoğan's ruling Justice and Development Party (AK Party) and thus become a viable alternative to this party instead of spending all their resources planning and executing deceit, lies and cheating, it may well have become a viable alternative for the Turkish masses to vote for in the June 24 elections. Yet this is not the case. The left-wing movement in general is known for its love for freedom, for moral values and for a humane approach to problems. It cares for the oppressed and the needy. These unfortunately are empty words for the CHP. Turkey needs a strong and viable left-wing opposition party to stand up to the AK Party and address the needs of the Turkish masses. However this does not exist. Thus, the AK Party uses left-wing arguments and a passion to serve the masses to come up with policies and services that win votes. The CHP on the other hand is using all its resources and energy to insult, defame and smear the AK Party in general and President Erdoğan in particular in a war of attrition that it is losing badly. They go to the extreme of officially sending 15 of their deputies to another opposition party to bolster their political ranks. No one bothers to think these deputies were elected by the votes of the CHP supporters and ask for the blessing of the people to take such action. Thus the sad story of the CHP leaves it hopelessly behind the AK Party.